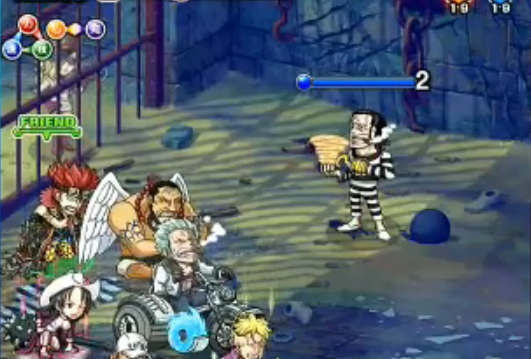 Sir Crocodile will use debuff protector. So don't turn delay or try to harm his shield. 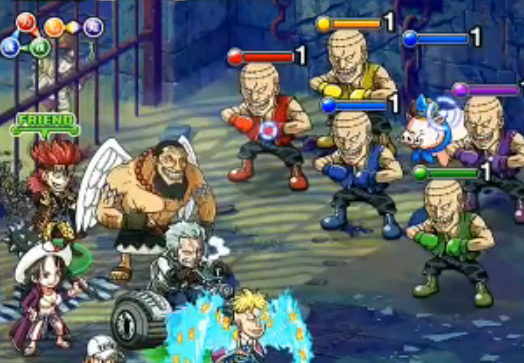 Bring a Striker only crew (Class ATK boost). Perfect isle to socket up your Crocodiles and Mr.1's. Giants, Baby Turtle and Teenage Turtle. The Giants do not use Pre-emptives or Specials so don't bother with the Red Giant 20% or below Health stall thing. He will pre-emptively Poison you. The Poison will deal 480 damage per turn. Fairly Easy - nothing much to say. Focus the Big Mobs and then take your time with the other 2 animals. I'd usually go for the Green Mob because she has a record of double-attacking if given the chance. The Random Boss of the Dungeon - He will pre-emptively buff his ATK and defence. He hits for around 2,224 damage and when his attack buff wears off - should drop to 2,020. 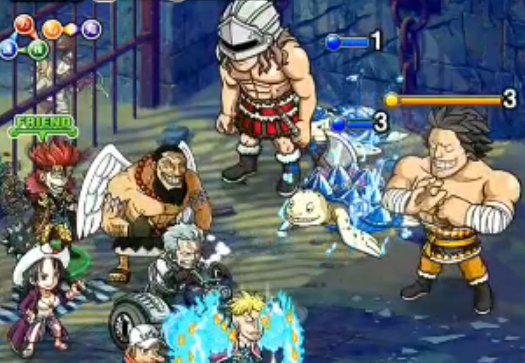 Paulie is replaceable with the Kraken (2x ATK to Striker). But STR damage not recommened to use here..
Orb switch with Chessmarimo and the big boobed DEX giant. 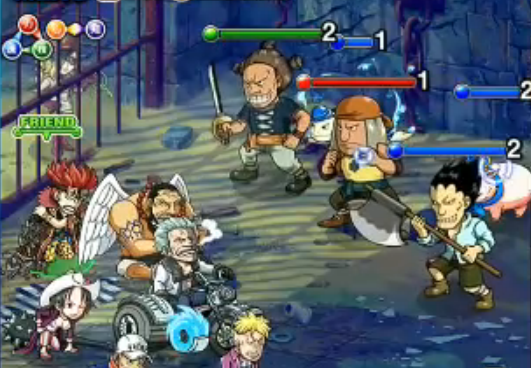 Then strenghten your Orbs with Kaku and finish Crocodile off. Since Impacts aren't affected by the conditions - it's only natural for Impact Teams to be the go-to team for 30-Stamina. 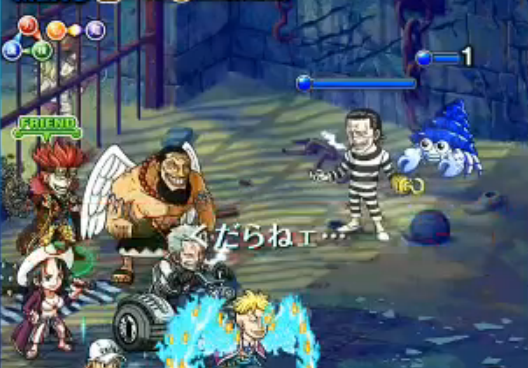 This team has an Orb-Booster and an Orb-Locker in case things gets messy and with Eustass Kid's Special - you can guaranteed a Force Orb when you need it. 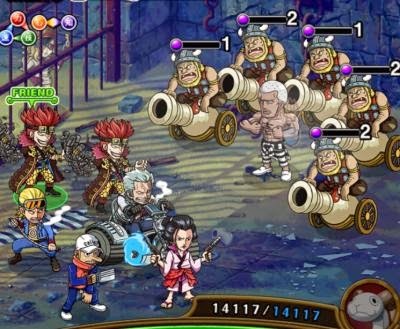 If you don't have Kid or Urouge, use Rakuyo as Captain. 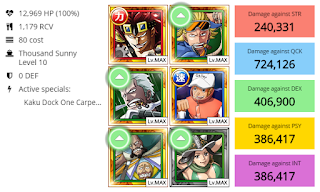 The other Impact Lead is Urogue - he boosts ATK by 2x and HP by 1.5x. The benefit is in the extra health to help survive or stall Crocodile's Poison (depending on what is needed). 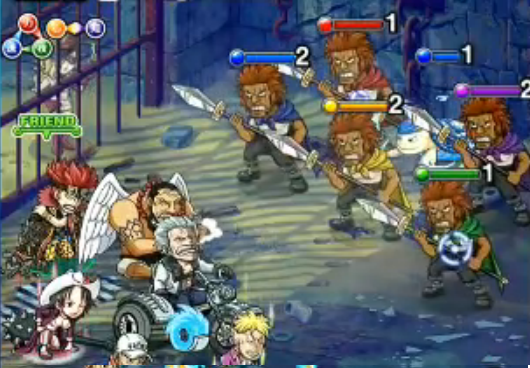 For the most part, this team can clear with normal attacks. 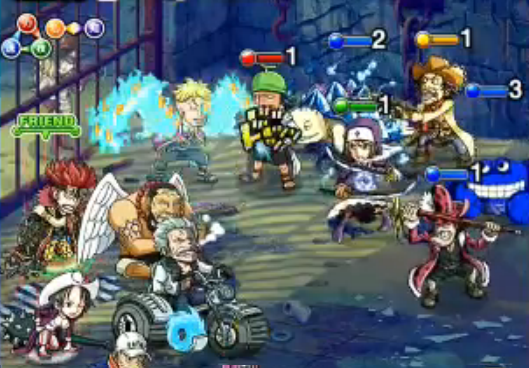 If you do face problems, you have (again) an Orb booster, locker and a 1.5x Impact Unit ATK buffer.